It’s that time of the year again! BollySpice presents to you our countdown of the ten magazine covers which we think were the coolest of 2012. We hope that you like them and agree with our choice of actors and actresses whom we felt looked the best this year. Enjoy! 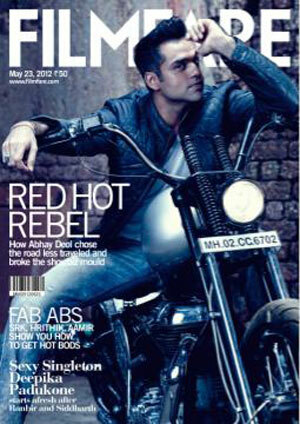 Abhay Deol just looked so nonchalant and trendy in this edition of Filmfare that we just had to include him in the list. We love the motorcycle he is sitting on, along with his very stylish outfit! Given that this year was Mr. Bachchan’s 70th Birthday, no doubt perhaps almost every Indian magazine wanted him to pose for their front cover. However, we think this one of Mr. Bachchan on the cover of December’s Hi Blitz not only looks classy, but is also a fitting tribute to one of Hindi cinema’s greatest actors! 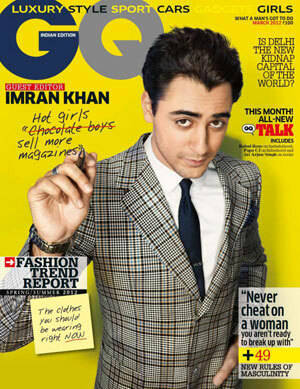 Imran Khan looks incredibly retro on this front cover of GQ India. This is probably one of Imran’s best magazine poses of the year so we felt that we had to share it. Shah Rukh Khan and Kajol not only make such a wonderful couple on the big screen, but also on a magazine cover. This great pose by the two superstars on Filmfare justifies this. Their pose and expressions are eye-catching and intriguing to look at! Priyanka Chopra looks like a beautiful rock star in this cover of GQ India. She got the pose just right with this one, which is why she has made it onto this list! Vidya Balan is not only one of the most talented actresses in the industry, but one of the most attractive also. Her appearance on this edition of CineBlitz illuminates her elegance, beauty and charm. Katrina Kaif has proven just by her look in this cover of FHM India that she is indeed one of the most beautiful women in the world. She looks ravishing while delivering a dignified pose. Sridevi not only made a successful movie comeback with English Vinglish, but also one of the most popular magazine poses in this edition of Filmfare. At the age of 49, Sridevi has proven that she is still one of the most attractive women in the industry, more so than certain actresses who are only in their twenties. Ranbir Kapoor looks like a proper rock star in this cover of the Hindi edition of Filmfare. Posing for this magazine just after having won the Filmfare Best Actor and Best Actor (Critics) Awards for his dramatic performance in Rockstar, Ranbir lives up to his character in the film by posing in this particular manner! We just love it so much that we had to make it the runner-up of this list. 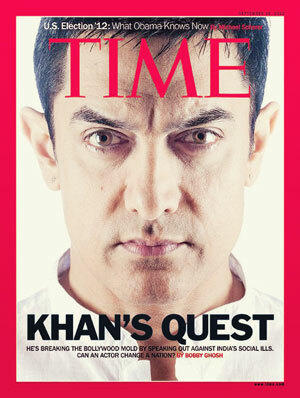 Aamir Khan made every South Asian man and woman proud by gracing the cover of Asia’s edition of Time Magazine. His praiseworthy humanitarian work through his hit television programme Satyamev Jayate was what landed him on this cover and he delivers a unique pose. By appearing in this magazine, Aamir Khan has set a fine example for other Bollywood stars by demonstrating that where possible, you should try and use your superstar status to help others and try and instigate some positive changes either in India or in another country. Well done Aamir! 16 queries in 0.415 seconds.